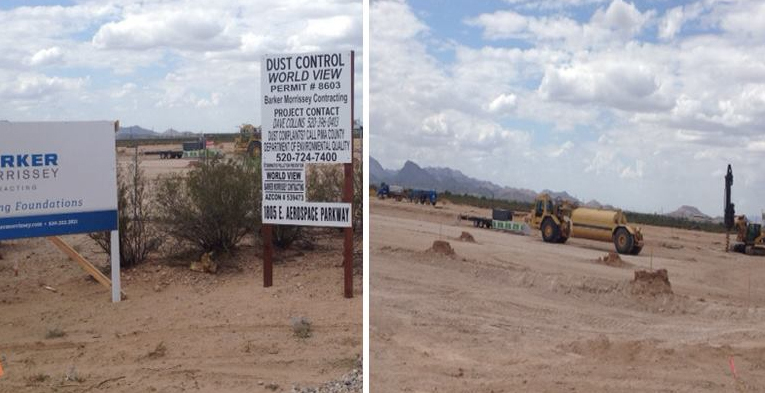 Contractors have begun blading the desert at the World View site. In the name of economic development, Rio Nuevo and Pima County are poised to dole out $70 million in corporate welfare to two big corporations– $50 million to Caterpillar and $20 million to World View. Ironically, one day before the Rio Nuevo Board announced the multi-million-dollar Caterpillar package for Tucson, I posted this article on saying “no” to Wall Street debt and corporate welfare and “yes” to helping local small businesses and entrepreneurs thrive with low-cost loans. Let’s think about this a moment. These two governmental entities are have voted to invest $70 million worth of taxpayer funds in two companies– one company is being lured away from other states to move here and the other is a Tucson company with big ideas and little cash. Is borrowing millions of dollars to give it away sustainable economic development? According to data from the University of Arizona Eller College, Tucson has one of the highest per capita rates of new patents in the US. We also have new start-up tech companies being nurtured at the UA Tech Park. We have smart scientists + new ideas. Why aren’t we helping entrepreneurs and growing our own local businesses with low-cost loans via a public bank? Instead of giving taxpayer money away in the form of incentives or free buildings, we should take all or part of the county’s rainy day funds (also taxpayer money) and establish a public bank which can be invested in Main Street small businesses and tech start-ups. The City of Tucson has dabbled in public banking with its Community Banking Project. At the urging of Local First Arizona (with back-up support from Arizonans for a New Economy), the city used $10 million of its rainy day funds to offer local business loans by partnering with Alliance Bank. In this video clip from a City Council Study Session (scroll in to 38 min mark), Alliance Bank President Duane Froeschle describes the success of this local business loan program and how his bank’s partnership with the city helps local businesses and the local economy. This is what sustainable economic development looks like. Just think how different the impact of Southern Arizona’s $70 million investment would be if we offered 70 low-cost loans of $1 million each– instead of mortgaging hard assets to give away $70 million in incentives and buildings. Spreading these economic development funds out across multiple local businesses and start-ups by offering low-cost loans (instead of giveaways) would highly diversify our local economy and create jobs in multiple sectors. Not only would offering low-cost loans through public banking partnerships with private community banks strengthen local businesses and community banks, the loans would generate a modest profit for the public bank, which can be used to create additional low-cost loans. (In actuality, many local businesses only need small loans to expand (far less than $1 million), but they often turn to credit cards because affordable loans are not available. The amount of money that is being spent on Caterpillar and World View could go a very long way.) This is “banking in the public interest.” This is sustainable economic development. Negotiated in secret over six months, Rio Nuevo’s $50-million-taxpayer-funded deal with Caterpillar will allow the company to move employees and close locations in other cities– like Milwaukee. According to the Tucson Sentinel, while Governor Doug Ducey and Rio Nuevo Chair Fletcher McClusker rejoiced at the news of Tucson’s big win, Caterpillar employees elsewhere are losing their jobs. Caterpillar announced last week that it will be closing five plants in other states and last fall the company announced that they will be laying off 10,000 workers, due to a 38% decrease in revenue since 2012. The headline in the Arizona Daily Star said that the Caterpillar deal includes 600 jobs; in the bowels of the same article it says that most of those jobs will be filled by current Caterpillar employees moving here. If Tucson were your daughter would you want her to date Caterpillar? Nor is the consideration fair to taxpayers. The County is using public credit to finance this project at taxpayer risk while a private corporation enjoys the benefits of the bargain risk­ free. Although World View will lease the building with an option to buy, this is an unlawful lease because County taxpayers are left with a $15 million bill should World View default. The County doesn’t even expect a return on its investment until the 18th year of its 20-year agreement, and given the speculative nature of World View’s business-it has never given a ride to a single passenger – it is doubtful that World View will remain financially viable. A few years ago, former City Council Member and Mayoral Candidate Molly McKasson warned the city against “putting off of its eggs in the development basket.” Developers and builders will be the immediate beneficiaries of the Caterpillar and World View deals. Only time will tell what Tucsonans will get out of it. Loaning $70 million to 70+ local small businesses or start-ups with good ideas, solid business plans, and transparent financial reports is far less risky than giving $70 million in incentives to two companies. Also– look at the potential for economic diversification when you lend to businesses representing different segments of the local economy. If local politicians are willing to spend $70 million in taxpayer funds on two companies, I suggest they have the money to invest ~$50,000 in a feasibility study to determine the pros and cons of establishing a Southern Arizona, Pima County or Tucson public bank to grow our local economy– instead of starving it with budget cuts, layoffs and increased taxes. With their feasibility study, the City of Santa Fe found that they could buy back bond debt and save millions if they established a local public bank. Local politicians owe it to the taxpayers to consider strategies for sustainable and diversified economic development. Pamela Powers Hannley is co-director of Arizonans for a New Economy, vice chair of the Public Banking Institute, and a candidate for the Arizona House, representing LD9. Public banking and economic reform are part of her platform. ← Public Banking & the Nonpartisan League: Is It Time for a Financial Revolution? Phenomenal article, Pam! I hope you send it to Mayor, Council, City Manager, County Manager, County Supes, AZ Daily Star Editors, and Joe Snell & Sun Corridor BoD.